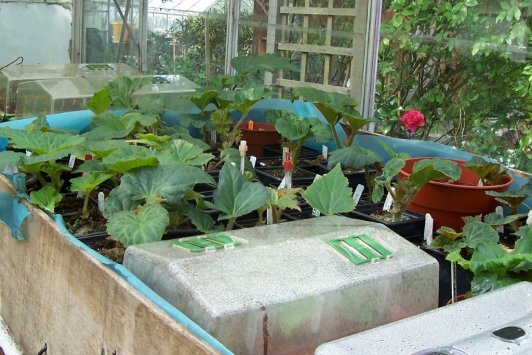 A Springtime visit to the South West Area Representative's greenhouses. “The last day of April saw a visit to Torquay, Devon, to meet up with Stewart Matthews, the area representative. 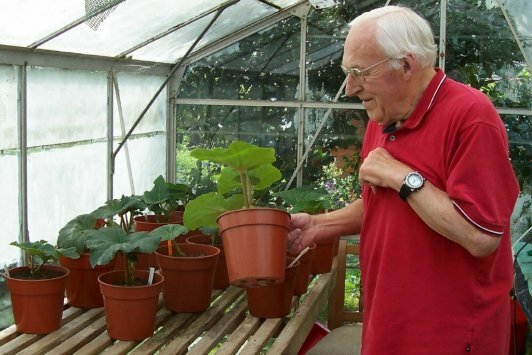 Stewart has been growing begonias since 1986 with considerable success. In 1990 he took top cards at the R.H.S. venue in London – the last time the NBS used this venue. The following year at the National in Birmingham he was placed first in the nine pot class. 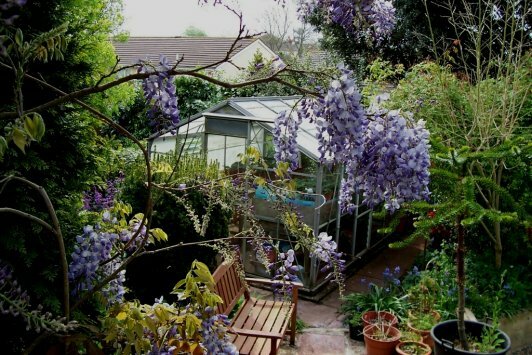 His set up in Torquay comprises 4 greenhouses which are located at the bottom of a beautiful garden almost invisible from the bungalow. The first house is a 8’ x 10’ and this is used to start all his cutting and tubers. Tubers are usually started in February and that gives an opportunity to take basal cuttings that Stewart considers are the best. At the time of our visit we were surprised by how much growth the plants had made. At the appropriate time these are then taken to the two 12’ x 8’ to give the plants space to grow on. The other smaller greenhouse is now used for tomatoes! The whole site is idyllic and is shaded by a mature evergreen Holm oak. 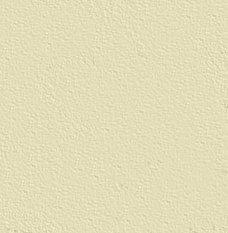 This gives shade to the houses but it is still necessary to apply shading – just in case. Tubers and cuttings on heated cable and in propagators. Stewart carefully inspects progress to date! 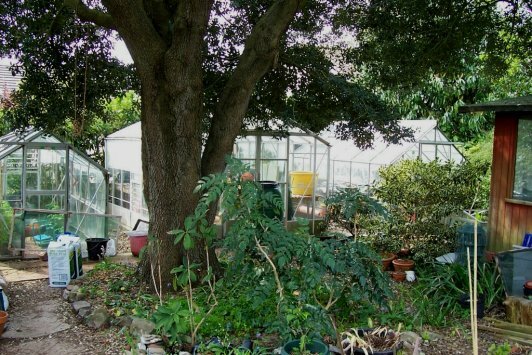 Bottom greenhouses under the canopy of the Holm Oak. Start up greenhouse viewed through the wisteria.